One of the most beguiling aspects of travelling in India is the country’s food culture. Local dishes, packed with chilli and bursting with spices, impossibly flavoursome and, of course, utterly delicious – from Rajasthan to Gujarat, Goa to Mumbai, no matter where you travel, you’re bound to have a memorable culinary experience. 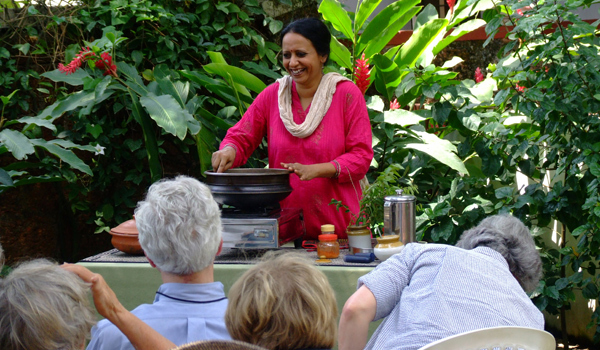 For those wishing to delve even further into Indian cuisine, why not sign up for a lesson? These six cookery courses in India will provide an accessible introduction – and will continue to inspire your meals even after your holiday has ended. New Delhi’s Taj Mahal Hotel isn’t just a stop for luxury-seekers – it’s also a haven for gourmands. 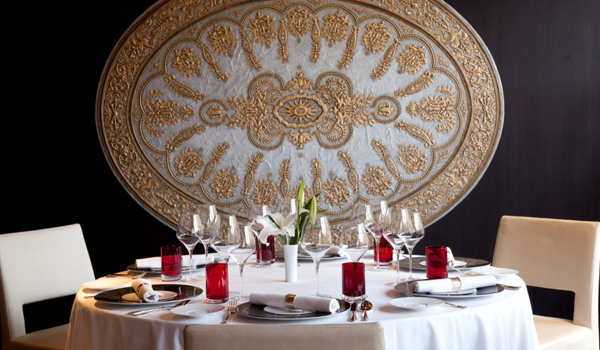 There are no fewer than seven restaurants on-site, one of which – the sophisticated Varq, which serves haute Indian dishes – also hosts cookery classes. 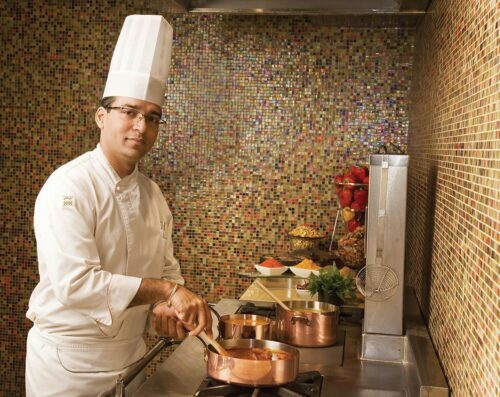 Guests will be invited to join Grand Master Chef Hemant Oberoi as he teaches the methods behind his favourite recipes, and will afterwards dine on the three-course meal they’ve created together. Eager to learn your curries from your chutneys, your puris from your pickles? 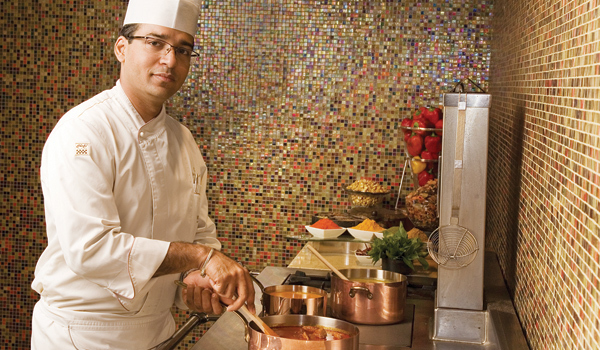 The Leela Palace in Udaipur doesn’t just offer a single cookery course: it hosts its very own culinary sojourn. For visiting food lovers, there are few better ways to become fully immersed in the art of Rajasthani cuisine: the three-day itinerary invites guests to work closely with the hotel’s head chef, to explore a local produce market, to take cookery classes – and to do plenty of sampling. Weighing up the best cookery courses in India? Venture to Nimmy Paul in Cochin, Kerala and you’ll be rewarded with home-cooked meals, cookery demonstrations, or even foodie home-stays for those really looking to learn the ins-and-outs of the local cuisine. Nimmy, a professional cookery instructor and consultant, schools visitors in the subtleties of the spice-forward and enlivening dishes. 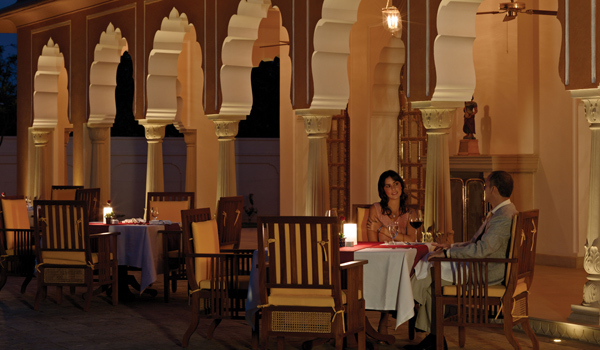 There are few better locations in which to sample the rich and regal cuisine of Rajasthan than the Oberoi Rajvilas – the Jaipur-based hotel is redolent of the region’s royal past. Classic Rajasthani dishes, once served to kings, will be prepared in front of and served to guests who’ve signed up for the hotel’s special cookery course – if you dare, you can even sample the signature, fiery lal maas. 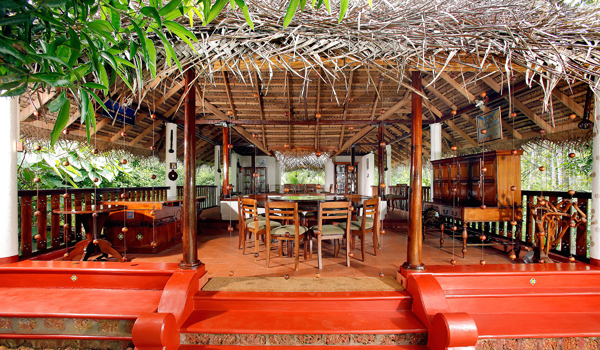 In gorgeously scenic Kottayam, Kerala, Philipkutty’s Farm hosts some of the best cookery courses in India. Guests stay in waterfront villas on a small island that’s host to the family-owned farm. Given that coconuts, bananas, and other produce are all grown on-site, you can bet the dishes prepared on the farm stay are as fresh and as local as it gets. An informal cookery course in the middle of a nature reserve – and dinner under the stars? 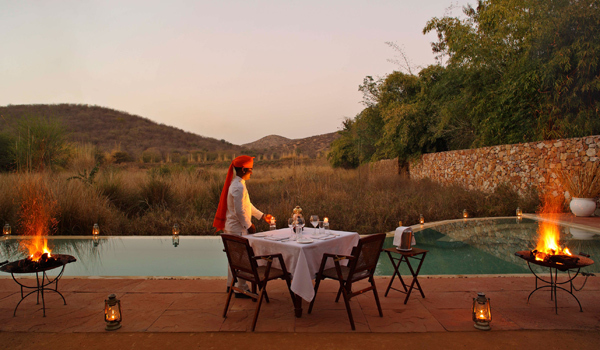 It’s only to be expected for guests who are staying at SUJÁN’s Sher Bagh Tented Camp, located in the wilds of Ranthambhore. Here, chefs cook only the freshest fare from locally sourced ingredients, and guests who are so inclined can try their hand at crafting a delicious and traditional dinner themselves.